Let’s bounce! Kelly has a bouncy, trouncy, fun, fun, fun, fun, fun collection this week. Ta Ta for Now is all about our favorite striped friend, Tigger. 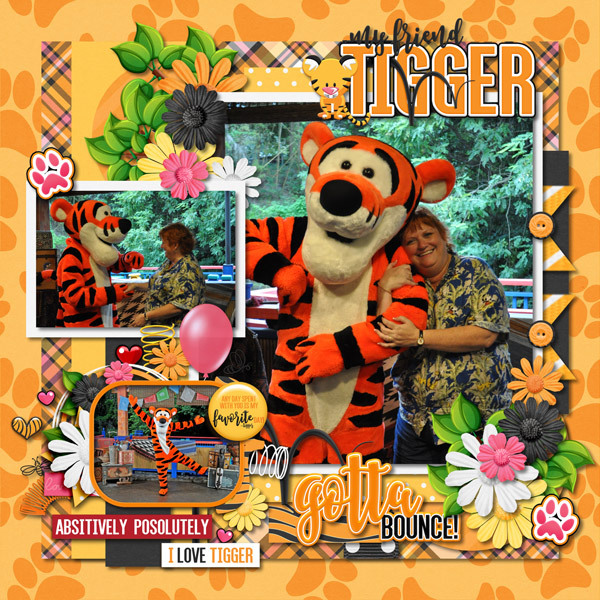 Capture your memories of meeting this energetic guy or visiting any other Hundred Acre Wood themed areas in the Disney Parks. Be sure to get the Page Starters, Journal Cards, Word Art, Word Flair, and Quick Pages to celebrate the most wonderful things about Tiggers. The kit includes 15 tiggerific papers and an orange alpha plus over 40 unique elements including balloons, bees, branch, buttons, hearts, paw, ribbons, springs, Tigger doll and much more! Now how about some adorable freebies to coordinate with this new kit? You can find them at Jenn’s Blog and Debbie H.’s Blog. Have a great weekend and happy scrapping!